Scripture is full of mountains. It’s full of people who set out on a journey with a mountain before them which they must climb. People like like Adam and Eve who are formed from the dust of the earth into humans and brought to life with the breath of God. They look out upon the earth for the first time and the entire mountain of human experience before them. People like Abraham and Sarah who faced a mountain of infertility God had promised them that they world have descendants more numerous than the start and bless the entire world. Yet into old age, they had not produced a child. Yes, scripture is full of people who face mountains. People like Moses whom God called through a burning bush and faced the mountain of his own feelings of inadequacy, uncertainty, and unworthiness. People like David who faced a mountain of a man in Goliath, a mountain of violence in the Philistine. Oh, David! He had a lot of mountains to climb. He also faced the mountain of his own desire for Bathsheba, another man’s wife. And after taking her for himself, he faced the mountain of shame and regret. Yes, people all throughout scripture had mountains to climb. Prophets like Hosea who’s own life and family would be a metaphor for God relationship with all of Israel. Prophets like Isaiah, Jeremiah, Amos and Micah who faced the mountains of holding kings to account for their corruption and neglect, mountains of people who had forsaken their covenant with God. People like Job who faced the highest mountain of loss we can imagine….his home, his family, his community, his entire way of life…and he had to climb the mountain of questions that would follow: Why, dear God? Why? We read stories about people who faced mountains in both the Hebrew Scriptures and the stories of Jesus, his disciples and the early church. People like Mary who faced the mountain of becoming pregnant without a husband and the ostracism that could bring. And more than that, she faced the mountain of giving birth to and being mother to the Son of God. People like the disciples who are called from boats and fields to put down their nets, leave everything and follow Jesus. A mountain of change within this immediate decision to follow, a decision that would alter their course of their entire lives. 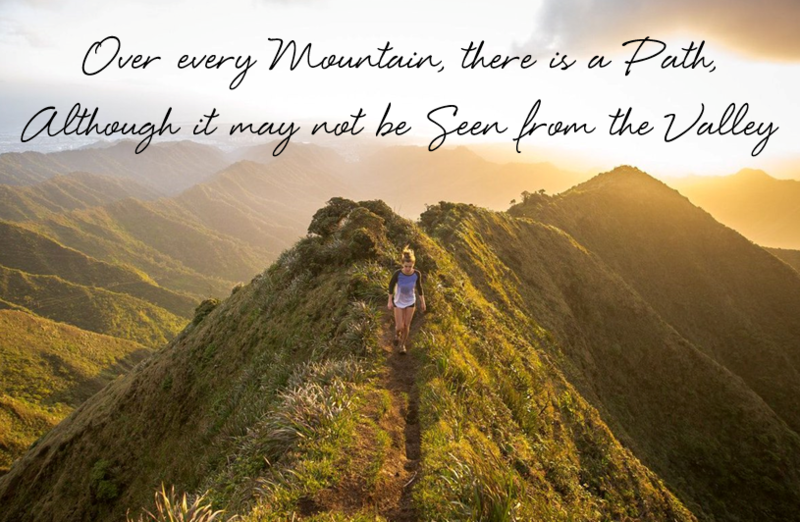 Yes, scripture is full of people who faced mountains. People like Paul who faced the monumental task of spreading the gospel of Jesus across the land to Gentiles who some Jews believed shouldn’t and couldn’t be part of the Jesus Movement. People like John of Patmos who were called to send a message of hope to God’s people in the midst of an evil empire that would surely kill him if he said clearly what he had to say. So, John faces the mountain of writing that message of hope as a vision cast in outlandish symbols and images which the empire wouldn’t understand, but which the people of God could discern. And he rolled up the scroll, gave it back to the attendant, and sat down. The eyes of all in the synagogue were fixed on him. Then he began to say to them, “Today this scripture has been fulfilled in your hearing. By reading this scroll from Isaiah, Jesus shows us that he knows his calling and his purpose….the usher in a time of healing and hope and release from all the evils of the world. Ca you imagine the mountain that must have been. Sitting at the base on that day, seeing the incredible task that lay before him: good news to the poor, release of those in captivity, healing of the sick blind and lame, freedom from all forms of oppression. I’d be paralyzed to do anything if I were in his shoes. How can one person do all that? All that seemingly impossible stuff? Wanderer, your footsteps are the road, and nothing more; wanderer, there is no road, the road is made by walking. Jesus knee that we make the path by walking. And so he takes a step forward committing to the mountain climb before him, accepting the task of his ministry by proclaiming it is so certain that it is fulfilled today as you hear the words! What faith! What a first step of up that great mountain that ends on Calvary! Brothers and sisters, we all have our different mountain to climb, just like the great people of scripture. The mountain waits for you. Right before you is the path that you make by walking, putting one foot in front of the other and with each step getting caught up in the presence of your Creator, your lord and savior, the one who will go with you all the way to the mountain top.